Marcel Lajos Breuer was born in Pécs, Hungary in 1902, and became on of the greatest architects and furniture designers of the 20th century . Breuer used new technologies and new materials in order to develop his 'International Style' of work. Breuer first studied art in Vienna after winning a scholarship. Marcel was unhappy with the institution and found work instead at a Vienese architecture office. From 1920 to 1928 he was a student and teacher at Germany's Bauhaus, a school of design where modern principles, technologies and the application of new materials were encouraged in both the industrial and fine arts. During his time spent there Marcel completed the carpentry apprenticeship. While there he designed and made the African chair and the Slatted chair. After completing his studies at the Bauhaus Marcel traveled to Paris, where he worked in an architects office. After a year he was appointed as head of the carpentry workshop at the Bauhaus. Breuer was given the title of 'young master'. Breuer helped to develop modular or unit construction. This is the combination of standardised units to form a technically simple but functional complete unit. Breuer was inspired by the shape and form of a bicycle handlebars when he created one of his most famous pieces, the Wassily Chair No B3 in 1925. It was designed and made for Wassily Kandinsky'. The frame of the chair was made from polished, bent, nickelled tubular steel, which later became chrome plated. The seat came in canvas, fabric or leather in black section. This chair has been widely copied. Breuer designed a whole range of tubular metal furniture including chairs, tables, stools and cupboards. Tubular steel has lots of qualities; it is affordable for the masses, hygienic and provides comfort without the need for springs to be introduced. Breuer considered all of his designs to be essential for modern living. Breuer also designed the interiors and furnishings for the master's houses at the Bauhaus, which by then had moved to Dessau. Not only did Breuer design furniture, he also designed a standardised metal house and later on designed his Bamboos house. Breuer continued to teach at the Bauhaus until 1928 and for the next three years directed his own architectural practice in Berlin. During this time he designed interiors, furniture and department stores. He became frustrated because the buildings he deigned still remained unbuilt. Because of a slump in the economy Breuer was forced to close his architectural office and traveled to the South of France, Spain, Greece and Morocco. In the next year on his return one of his architectural commissions was realised. The Harnischmacher House, Wiesbaden. He later designed the Wohnbedarf furniture store in Zurich. Two years later Breuer joined Alfred and Emil Roth. They worked on a joint venture in designing the Doldertal Houses. These were a pair of apartment blocks in Zurich for Sigfried Giedion the man who founded the Wohnbedarf company. 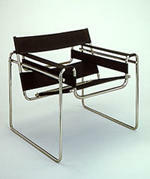 From 1932 to 1934, Breuer deigned and realised a range of furniture made from flat bands of steel and aluminium. The range of furniture was manufactured and sold by the Wohnbedarf company. His furniture was in fact more popular in the 1970's than it was when it was originally designed.. In 1935 Breuer was forced to emigrate to London. This was to escape the Nazis. He felt threatened as his origins were Hungarian-Jewish. In London he worked in partnership with the architect, F.R.S Yorke and together they they completed several houses in Sussex, Hampshire, Berkshire and Bristol. In 1936 they designed the Gane pavilion in Bristol, which combined wood and local stone. This was very different from the type of work produced at the Bauhaus, combining steel, glass and modern materials. 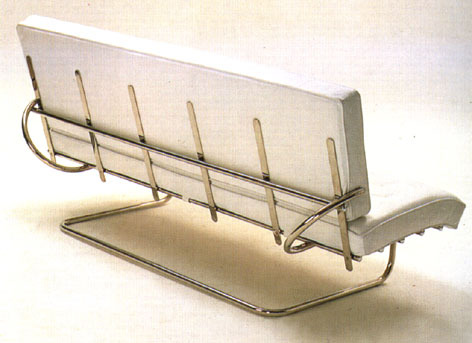 When Breuer was was employed at the Jack Pritchard's Company Isokon he designed and made five plywood pieces of furniture. These were a plywood version of his earlier metal designs. The design of these chairs were influenced by the work of Alvar Aalto. 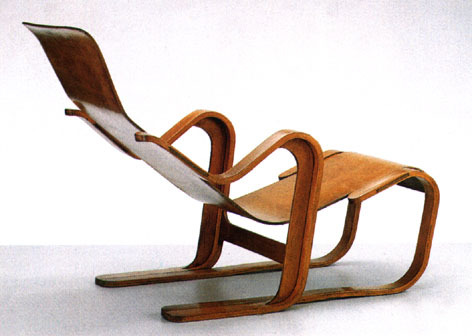 Aalto designed and made plywood furniture and exhibited in Britain in 1933. 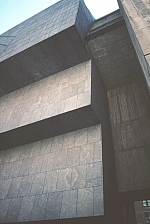 After 1937 Breuer moved to America. He was offered a professorship at Harvard University' s School of Design in Cambridge, Massachusetts. He set up an architectural studio with Walter Gropius in Massachusetts and together they designed the Pennsylvania Pavilion at the 1939 New York's World Fair. They also designed several houses together, including Gropius's own house. In 1941 Breuer decided to set up his own architectural practice, which he moved to New York in 1946. This proved to be one of Breuer's most productive periods. Between 1940 and 1950 he designed seventy private houses, one of which included his own house in 1947. In the same year the Museum of Modern Art in New York ran a touring exhibition of Breuer's work and in 1948 asked him to design a low-cost house in the grounds of the museum, which was targeted at the average American family. He filled the house with plywood cut-out furniture. In 1953 Breuer worked as part of a team designing the UNESCO building in Paris and also designed the Bijenkorff department store in Rotterdam. In 1956 Breuer as well as setting up' Marcel Breuer and Associates in New York began using concrete for his architectural commissions. He was asked to design the Whitney Museum of American Art in new york in 1966. The images below show the innovative way in which the concrete has been used. The building looks like it has been sculptured out of one complete block of concrete. Breuer was one of the founders of the Modern Movement His furniture like Robin Day's Polyprop Chair can be classed as democratic. Affordable furniture for the masses. Our complete set of EX0-101 test questions and cissp practice test study guides you in exact way so you will pass your real mcse exam & 70-432 dumps with flying colors of db2 certification.